The twenty-ninth edition of Natalidea is dedicated to traders and artisans affected by the collapse of Morandi Bridge. 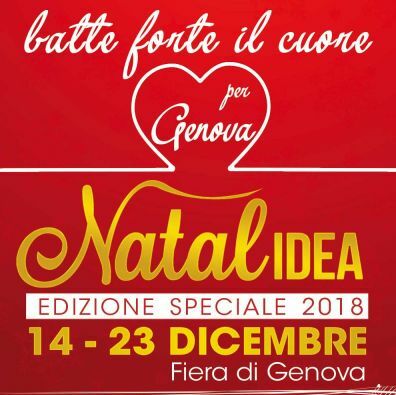 The event is organized by "Fiera di Genova" in the Blue Pavilion from Friday 14 to Sunday 23 December: ten days and ten nights during which you can choose gifts, prepare the party table and relax. This year, as always, you will find at the fair quality products and crafts, furnishings for home, car, motorcycle and camper and regional and foreign food and wine. There will also be an area dedicated to catering, take away and truck food (for a snack or for dinner). Lastly, the "Family Fun stage" - coordinated by Cheidea! - will play an important role during the fair. On stage - alongside events, creative workshops and shows for children - promotional initiatives will take place to support Valpolcevera and the West Liguria. Natalidea will be open from Monday to Thursday from 3 pm to 9.30 pm, on Friday from 3 pm to 10.30 pm and on the two weekends from 10 am to 10.30 pm (exception: Sunday 23rd - early closing at 8 pm). Parking inside the fair district.